Human skin is characterized by structural and bioactive lipids that play key roles in skin health and pathology. An important role of the skin is to confer protection against environmental injury, including stress resulting from exposure to the ultraviolet irradiation (UVI) in sunlight. It is well known that UVI is responsible of skin cancer, immune suppression, photosensitivity disorders and premature skin ageing. Oxidative stress plays a central role in the cutaneous response to UVI. Previous studies have shown that UVs (especially UVA) result in oxidative stress with an increase in malondialdehyde (MDA) reflecting lipid oxidation. Furthermore, UVI increases the release of polyunsaturated fatty acids (PUFAs) in the skin by up regulating the synthesis and activity of phospholipase A2 (PLA2) through increased oxidative stress-mediated reactions. Proteins expression such as cycloxygenases (COXs) and lipoxygenases (LOXs) are also up regulated by UVB, along with increased levels of bioactive lipids (eicosanoids). This metabolic pathway leads to an inflammatory response in the skin. The aim of this study was to develop a skin explant model to explore the effects of UVI on cutaneous lipids: lipid peroxidation (MDA) and PUFAs metabolism (eicosanoids) from a kinetic point of view. Human skin explants from BioEc model (1.5 x 1.5 cm) were maintained in culture at the air-liquid interface in a survival medium during 4 days. The UV A+B source used is a Vilbert- Lourmat lamp. The skin explants were irradiated at 3 MED (Minimal Erythema Dose), (n=3 by condition). Lipidomic analyses were performed at 6, 24, 48 and 72 hours after UV irradiation. 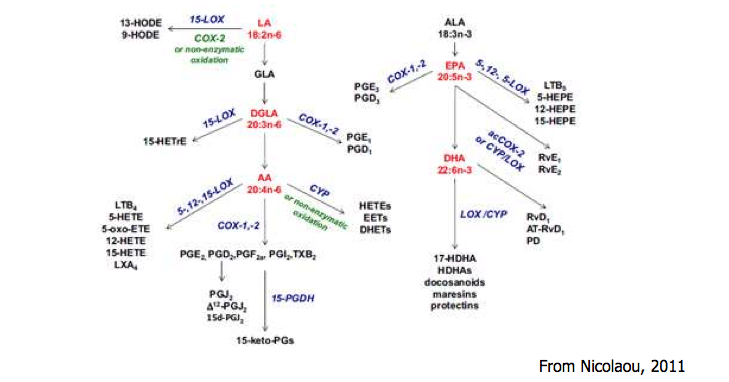 After extraction, the measured biochemical markers of interest were: lipid peroxidation marker MDA by GC/MS method and lipid mediators involved in UV-induced inflammation, PUFAs and eicosanoids (prostaglandins, HETEs and lipoxins) by LC/MS method. Released PUFAs serve as precursors to various eicosanoids that are formed by cutaneous cyclooxygenase (COX), and terminal prostanoid synthases (PGs), lipoxygenases (LOXs) and cytochrome P450 (CYP) enzymes. The figure shows a schematic overview of biosynthetic pathways for the main biologically relevant oxygenated products of PUFAs. 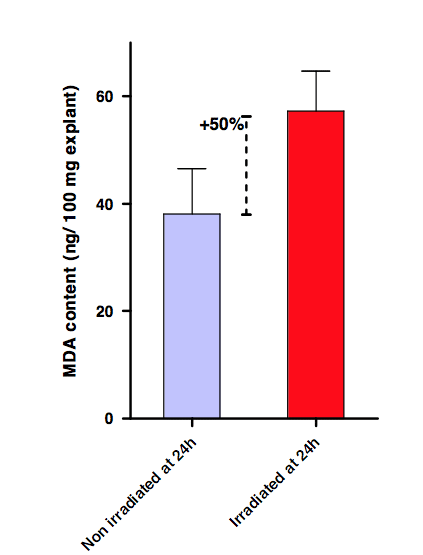 Twenty-four hours after a 3 MED irradiation of the skin explants, a significant increase (+50%) of the lipid peroxidation marker (MDA) was observed as excepted, reflected lipid oxidation. An increase of PUFAs (AA arachidonic acid, ALA alpha-linolenic acid, EPA eicosapentanoic acid and DHA docosahexaenoic acid) levels was observed as soon as 6 hours after irradiation due to the up-regulation of the PLA2. This increase continues during 48 hours and 72 hours after irradiation depending on the considered compound. PUFAs release was followed by an increase of prostaglandins especially PGE2 with a pic at 48 hours after UV irradiation. The increase could be explained by the up regulation of COX-2. A significant increase of HETEs levels (5, 8, 11, 12 and 15 HETEs) was registered until 48 and/or 72 hours, depending on the markers. This increase could be explained by the up-regulation of LOXs and CYP450 mono-oxygenase. Lipoxins A4 and B4, lipid mediators involved in the resolution of cutaneous inflammation, were detected 72 hours after UV irradiation. ->The UV-response profile of these bioactive lipids is close to the one observed in the skin in vivo. The pertinence of the biochemical evaluation to better characterize UV-induced inflammation was demonstrated in this study. This “inflammed” skin explant model allowed us to explore the effects of UV irradiation on cutaneous bioactive lipids by measuring lipids peroxidation (MDA) and PUFAs metabolism (eicosanoids). The UV-response profile of these bioactive lipids is close to the one observed in vivo. In other words, this ex vivo model could be used to evaluate and better understand the preventive or curative action of dermo-cosmetic formulations. Nicolaou A. Eicosanoids in skin inflammation. Prostaglandins, Leukotriens and Essential Fatty Acids (2013), 88, 131-138. Nicolaou A. et al Ultraviolet-radiation induced skin inflammation: dissecting the role of bioactive lipids. Chemistry and Physics of Lipids (2011), 164, 535-543. Rhodes L. et al The sunburn response in human skin is characterized by sequential eicosanoid profiles that may mediate its early and late phases. FASEB J (2009), 23, 3947-3956. 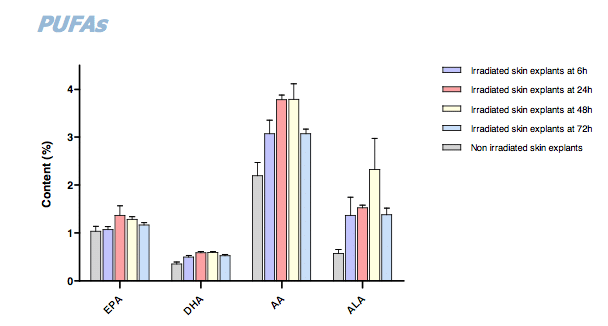 Judson B. et al Ultraviolet radiation inhibits 15-hydroxyprostaglandin dehydrogenase levels in human skin: evidence of transcriptional suppression. Cancer Prev. Res. (Phila.) (2010), 3, 1104-1111.